Gerard recorded these arms in 1633 as those of John Holme, who came to possess Newton Surmaville through the death of his father-in-law, John Musket, in 1373. Musket's heir was his daughter Agnes, wife of John Holme. 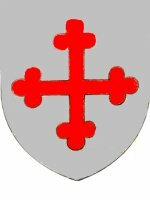 The arms were argent, a cross botonné gules (on a silver field, a red cross with the ends shaped like a trefoil). The estate of Newton Surmaville came to the Burnell family in 1442. 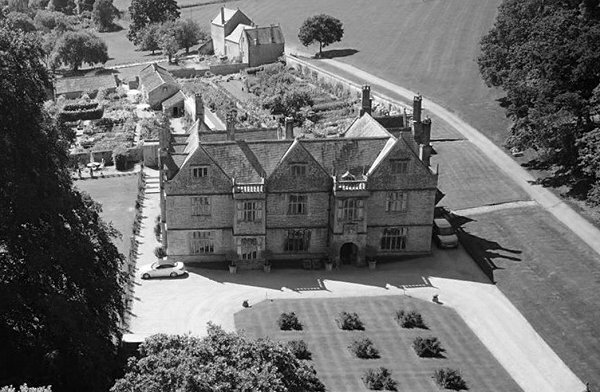 John Burnell sold the estate to John Compton in 1510. The arms of this family are recorded by Gerard of Trent in his 'particular description' of Somerset in 1633. 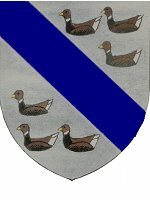 The arms of Burnell were argent, a bend azure between six Brent geese proper (on a silver shield a blue straight stripe extending from the left, or sinister, corner to the opposite edge of the shield, between six Brent geese in natural colours). John Compton of Beckington acquired Newton Surmaville from John Burnell in 1510. His grandson, another John Compton, sold Newton to Robert Harbyn of Wyke, near Gillingham, Dorset, in 1608. 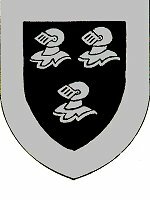 The Compton arms were sable, three helmets within a bordure argent (three silver helmets on a shield with a black ground and a silver border. 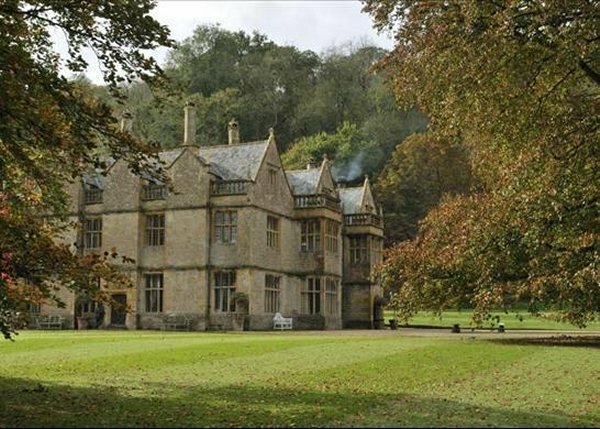 A prosperous and wealthy mercer, Robert Harbin (1526-1621) began acquiring a number of small properties in Dorset and Somerset. His final purchase was in 1608 when he purchased an estate from Joseph Compton. 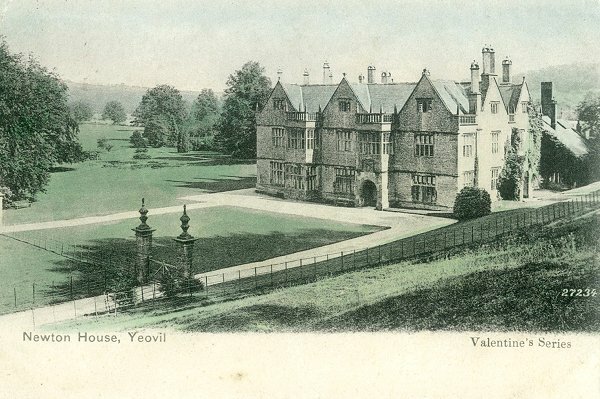 The estate, to the southeast of the town of Yeovil, was known as Newton Surmaville, named after a French family, the de Salmonvilles, from a small village near Rouen, who first built a mediaeval house on the site where the current house now stands. 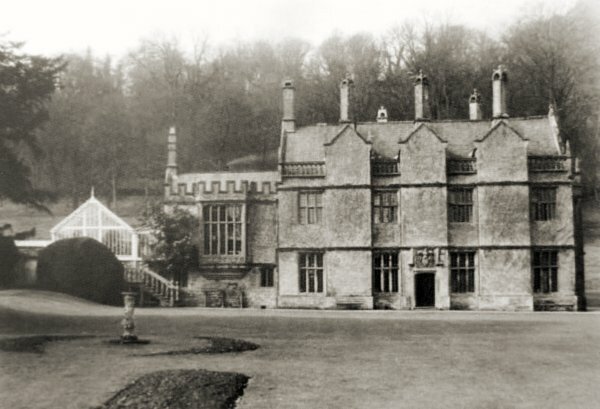 Robert Harbin and his eldest son, John (1560-1638), commissioned the building of a new grand country house at Newton, which was completed around 1612. Robert and his son John moved into Harbin Castle, later called Newton Surmaville House. The house remained in the Harbin family home for 399 years, through more than ten successive generations. 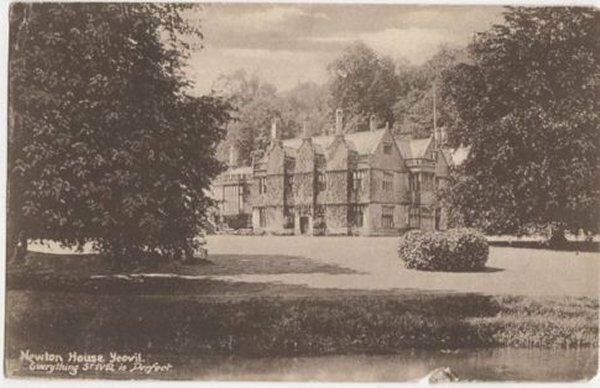 Following the death of Sophie Rawlins (née Sophie Wyndham Bates Harbin), Newton Surmaville House was sold in 2007 - for the first time in its history. Country House. Built between 1608 and 1612 for Robert Harbin, with minor C19 modifications. Ham stone cut, squared and random coursed, with ashlar dressings; Welsh slate roofs between coped gables, with some lead flat roofs stone chimney stacks with pierced stone cowls crowned with ball finials. Medieval hall with flanking porch and passage translated into Classical and symmetrical terms, somewhat influenced by nearby, and just earlier, Montacute House; Library and rear services added 1875: principal (north) elevation of 2-storeys with gable attics 5-bays, of which -1, -3 and -5 are gabled, and -2 and -4 project with flat roofs behind balustered parapets. Plinthed, with string courses, plain coped gables with profusion of finials including obelisks: semi- circular arched entrance porch in bay-4 with heavy door in recess, square panel over cutting into string course with arms of Harbin impaling Pert; 5-light by 3-light ovolo mould mullioned and transomed square bay windows through both storeys bay-2 and upper bay-4; elsewhere matching 5-light windows to ground floor, 4-light to first floor, and 3-lights without transomes to attic gables. 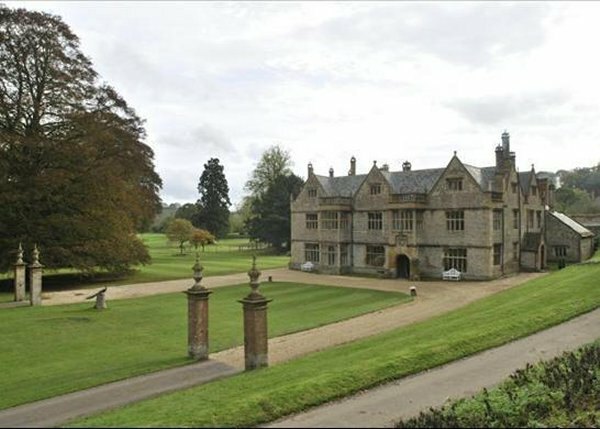 East front to river of 4-bays separated by projecting gables with chimney stacks, one of which is a chimney: central projection has plain doorway with coat of arms in panel over: 3-light mullioned and transomed windows to full width each bay, bays-2 and -3; plinth, string courses, balustraded parapets between gables. West elevation plain, with simple single-storey projecting porch in centre. Internally the principal rooms little altered: entrance passage leads through to mostly C19 staircase lobby; to right the breakfast parlour (formerly the buttery), with original panelling, and to the left the one-storey hall, with slightly later panelling and a Georgian cornice to a plain ceiling through this room, in the northeast corner, the drawing room, with probably original panelling and thin-ribbed plaster ceiling; beyond this, along the east front, again with original panelling and thin-ribbed ceiling, with pendants. The staircase to the rear, wrapped around the garde-robe flue, was radically altered in the C19 when the rear passage was formed. The central first floor bedroom has an original plaster ceiling and panelling as well as an original fireplace and several tapestries; the first floor library, in the southeast corner has a prominent oriel window, and was added in 1875 to the design of Joseph N Johnstone. On the south side a paved courtyard with C19 stables and the Wring-house, or Cider room. Some men in the employ of G Harbin Esq, of Newton House, caught a fine pike in the River Yeo a few days since. It weighed 19lbs (8.6kg) and measured three feet three inches (99cm) in length, its circumference being 16 inches (40cm). They also caught a trout, weighing four pounds and a quarter (1.93kg). For details of the 1921 Westland 'Walrus' crash in the grounds of Newton Surmaville click here. 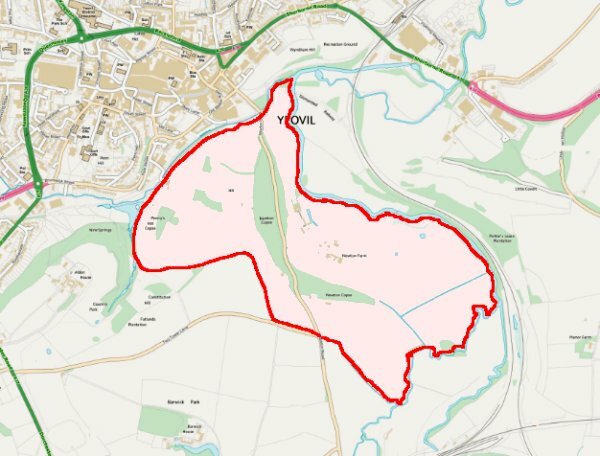 The Newton Surmaville estate (based on the 1846 Tithe Map) outlined on a modern map. 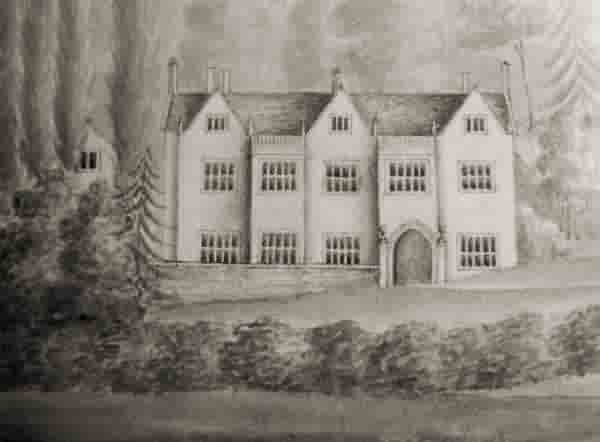 An early 18th century print of Newton House. 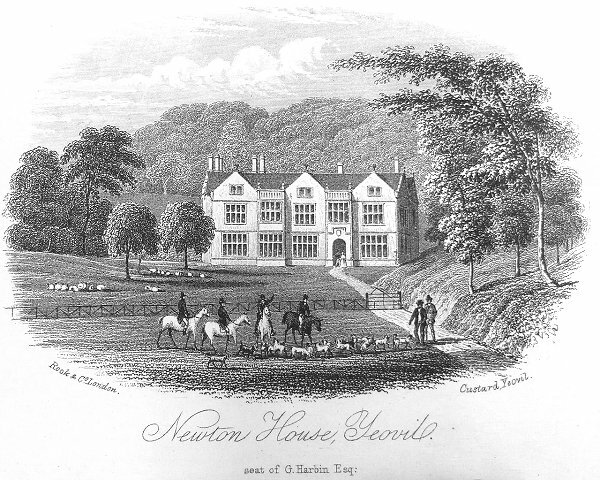 An etching of Newton House, made during the mid-nineteenth century and published by Yeovil bookseller, printer and stationer Henry Marsh Custard. 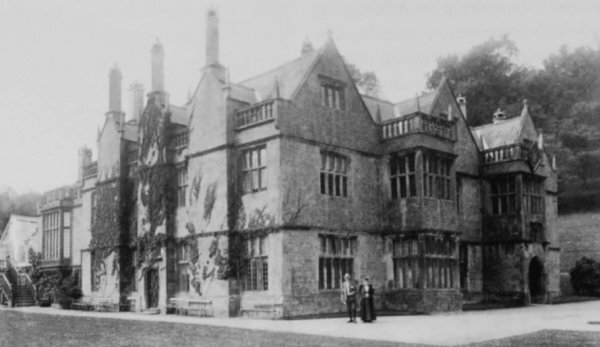 Newton Surmaville House, photographed around 1900. 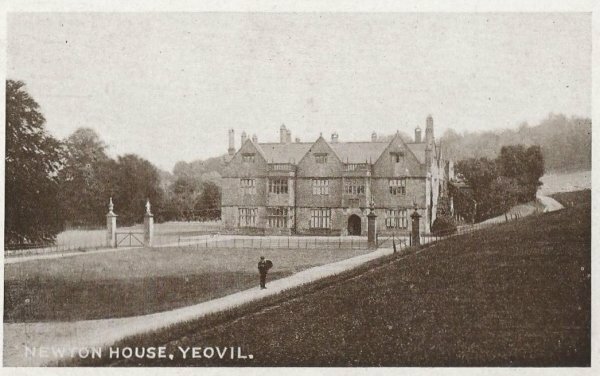 Newton Surmaville House, at centre, and Newton Woods set in the tranquil Yeo valley in a postcard of about 1908. 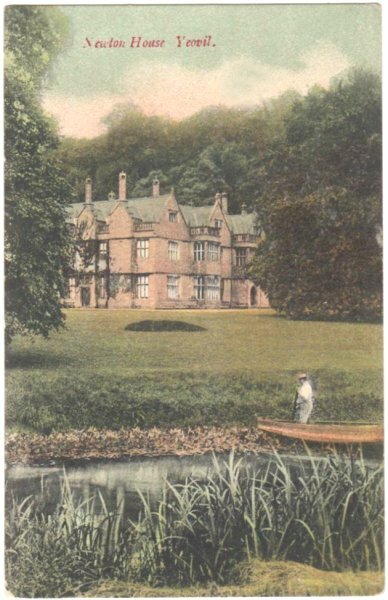 A postcard of 1910 showing Newton House from the River Yeo. 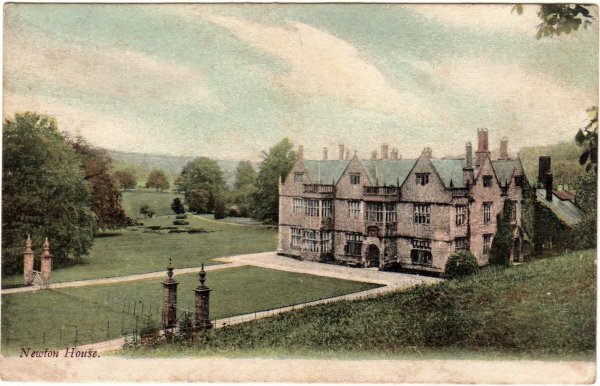 A postcard of Newton House used by Aplin & Barrett for advertising their St Ivel brand. .... and a variation on a theme by Aplin & Barrett. 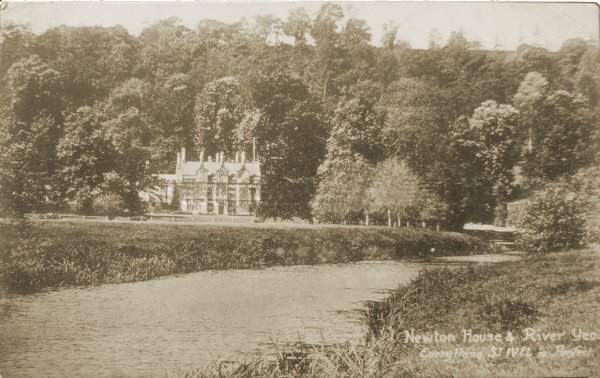 Newton House photographed around 1930. 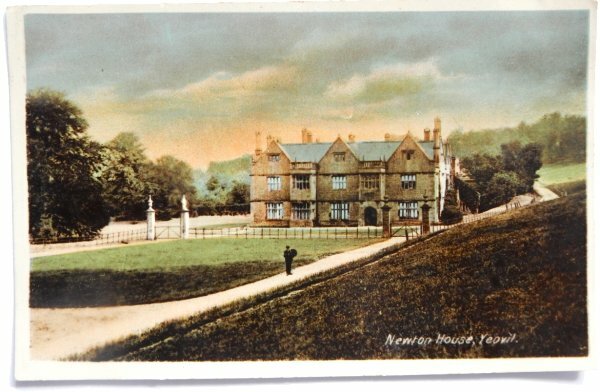 A postcard of Newton House, probably from the 1950s. 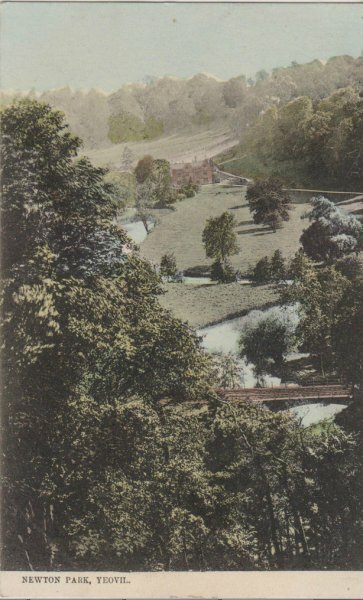 The same view as above but in a hand-coloured postcard. .... and a postcard view from a slightly different angle. The original photograph was taken by Yeovil Photographer Jarratt Beckett and published in his 1897 book "Somerset viewed through a Camera". This photograph was still being used on postcards in the 1960s. From my collection. This photograph features in my book "A-Z of Yeovil"
.... and the same image hand-coloured with a dramatic sky. 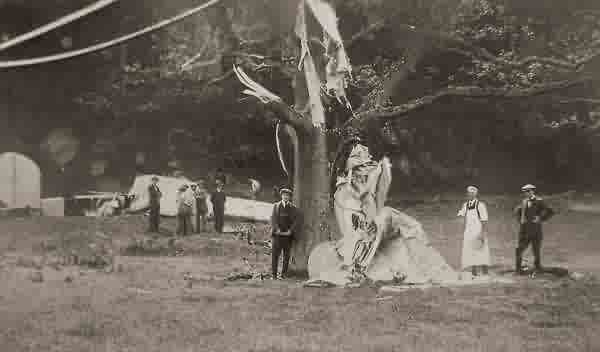 The remains of a biplane that crashed in the grounds of Newton Surmaville in 1920. Ouch! The machine was flown by Flying Officer Shaylor and hit this tree. The pilot was thrown out but escaped with only cuts and bruises. Suffice to say the machine did not fly again. 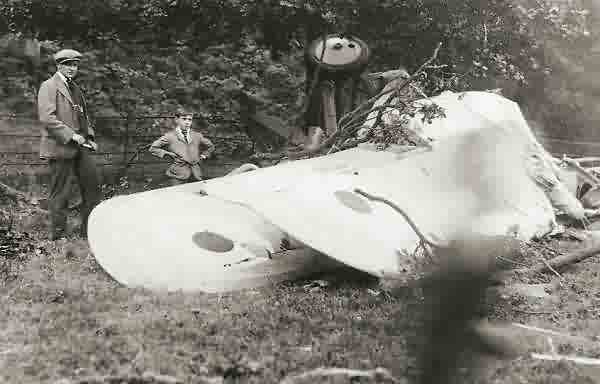 This is thought to be another photograph of the same biplane crash. Newton Surmaville house from the air. A delightful hand-coloured postcard featuring an unusual aerial view of Newton Park. 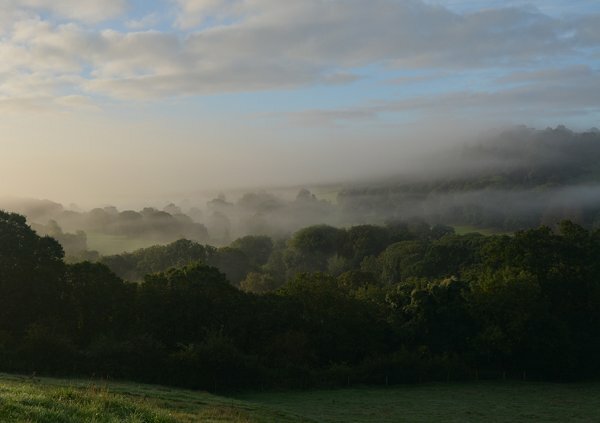 Early morning mists across the Newton Surmaville valley, a scene largely unchanged for centuries. 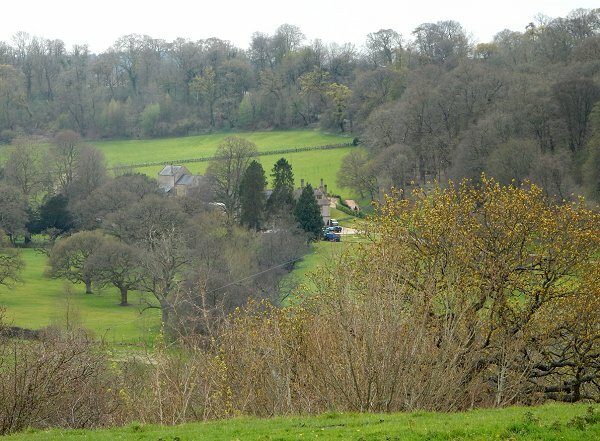 Seen from Wyndham Hill and photographed in 2014. Newton Surmaville House, photographed as part of the sale details in 2007. Nestling in the Yeo valley. 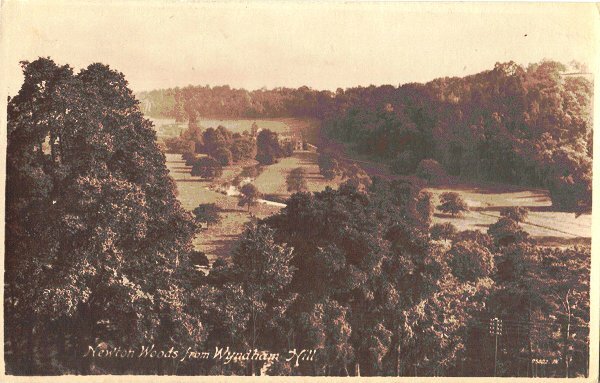 Photographed from Wyndham Hill in 2016.